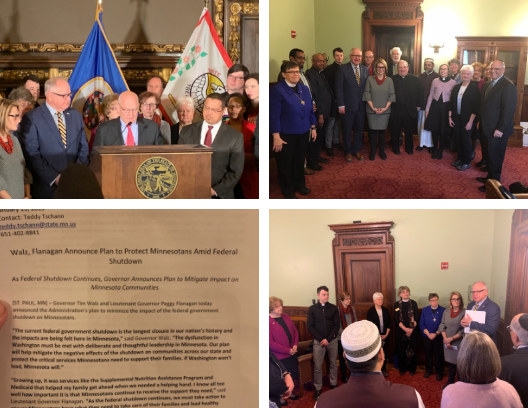 St. Paul, MN—January 15, 2019: Sisters Carolyn Puccio, CSJ, and Meg Gillespie, CSJ, with CSJ Justice Co-Director, Marty Roers attended a press conference today with MN Governor Tim Walz and Lt. Governor Peggy Flanagan. The event addressed the statewide impact of the current partial Federal shutdown. Members of Minnesota’s faith community, including representatives from the Sisters of St. Joseph of Carondelet (CSJ) community stood in solidarity with all those who are suffering from the shutdown’s associated financial, social and spiritual hardships. A provided handout stated that “Governor Walz is working closely with Minnesota’s Congressional Delegation to support Minnesotans adversely affected by the shutdown and coordinate with governors across the country to join together in action on behalf of the states.” “Federal grants help fund critical services in Minnesota. This includes support for Medicaid, highways, Temporary Assistance for Needy Families, Veterans Healthcare and Food Security programs such as SNAP and School lunch[es].” Minnesota’s tribal communities are also impacted. The Sisters of St. Joseph of Carondelet are committed to moving always toward the profound love of God and love of neighbor without distinction.